Cast your mind back…you may remember that my fella, Mike, was set a boyfriend style challenge with QUIZ Clothing, where he picked my look from head to toe. If you missed it, check it out by clicking here. And I have to say – he ruddy nailed it. Well, the tables have turned – it’s time to style you up a treat, m’darling! Yes Mike – you are going to be my own personal Dan Edgar from Towie, who you’ll find modelling the new TOWIE x QUIZMAN capsule collection. And I think you are going to love what I have picked out for you…fingers crossed! 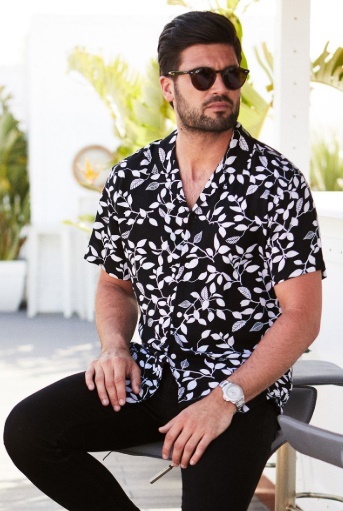 I must say the selection of shirts for Men on offer onsite is actually outstanding, combining crisp prints and quality tailoring for a really great price. This one in particular? Hello £29.99! I am digging this floral number because its wearable print in a classic colour way looks fresh and fun. Great under a suit for summer weddings or a la Dan paired with chino shorts for hot to trot days out – it’s a must-have for the gents in our lives. Time for some dapper chap vibes! This checked number is ticking all the style boxes for me, at a price that will mean there’s still money for espresso martini’s (or more likely beers). Nicely lined with a cheeky pocket square, this little bit of lush will set you back £69.99. Your yacht is waiting sir! I don’t know about your beau, but mine is a sucker for a classic polo neck. And why wouldn’t he be? They are the male equivalent of the “nice top” to go with jeans for nailing smart casual style. Well QUIZMAN have elevated this go to style by making it have a sassy soft rib through it and swapped the buttons out for a cheeky bit of zip action. It’s little twists like that make this particular polo a bit different and more stylised. Available in black, as well as white and grey, as WELL as being under £20, I think the boyfriend needs it in every colour! I’m pushing the boy out of his comfort zone here…stretch jeans could be a step too far. But before we break up (please don’t – I love you), I think giving a pair of slimmer, stretch jeans a whirl in black might be a game changer. 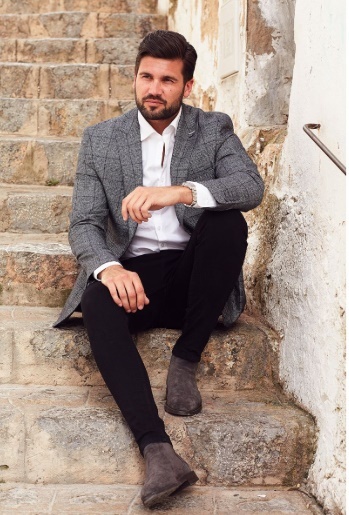 I mean – look at Dan here…look how smart the cut of these jeans look with one of the fab blazers from the collection and how neatly they tuck into the Chelsea desert boots. They are a great alternative to traditional suit trousers for a more contemporary look. Plus…they are £24.99 – holy moly!!! Ok, if you like Pina Coladas and getting caught in the rain, you are going to love this shirt. The pattern might be a bit out there…but when you do it in monochrome, you can up the fashion ante and still be in your comfort zone! Bringing a slice of the beach to the everyday, this is a fun and fierce addition to any bloke’s wardrobe. And…I am not adverse to “borrowing” (stealing) this for myself, Michael. Fillies, be sure to check out QUIZMAN for the gents in your life – it’s en pointe and it’s priced blinking well. And fellas…if you do treat yourself to some new pieces from the collection, expect your lady to be suitably impressed at your trend ticking new duds. Everyone’s a winner! For more menswear and general maleness – be sure to check out all Michael’s post under the FDJ Homme tab here. Oh and he now has an Instagram too – so why not pop a follow over at www.instagram.com/fdj_homme. *This post is in collaboration with QUIZMAN – all choices and opinions are our own as always though fillies.